Based in New York and Taiwan J.C. Architecture (JCA) is an award-winning multidisciplinary design firm that undertakes projects across a wide range of industries, describing themselves as a studio think tank, developing, researching and experimenting methodologies for new possibilities. In Taipei, JCA were commissioned by Happier Café to design a multi-purpose cafe and meeting space of 315 square meters that would make an impact through its simplicity and function. One of the project’s principal challenges lay in the client’s incredibly small budget. “We were approached by the clients to design a multi-purpose cafe and meeting space that would be inspiring and impactful through its simplicity and function, states JCA founder, Johnny Chiu. “Given the short-term lease of the site, we initiated the conceptualisation as a temporary art installation to bring a fresh perspective to the former plain library building. began to consider how the various characteristics and qualities of this affordable and versatile material might be harnessed. needs and emotional state of being,” says Chiu. Paper Space redefines the idea of community as a shared, evergrowing project. The design wanted to have a life in the community beyond its exhibition time. Using the customer’s interaction to physically alter the space inverts the typical café experience. It allows guests to contribute to a deeper practice of community formation and creates a lasting impact on individuals beyond the physical time spent in the space. Rather than using more conventional hard materials and surfaces to compartmentalise the space into the separate areas required to conduct the business, instead suspended papers flow three-dimensionally across the cafe to shape durable yet flexible boundaries that fluidly coalesce into organised forms. 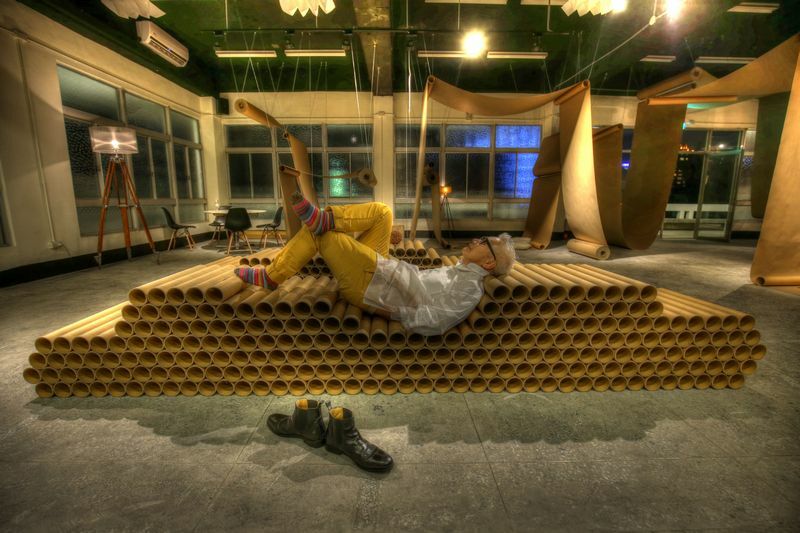 The large paper rolls are hung in various heights and distances to create passageways or private spaces, various private settings for patrons to dine, lounge around, rest or play. 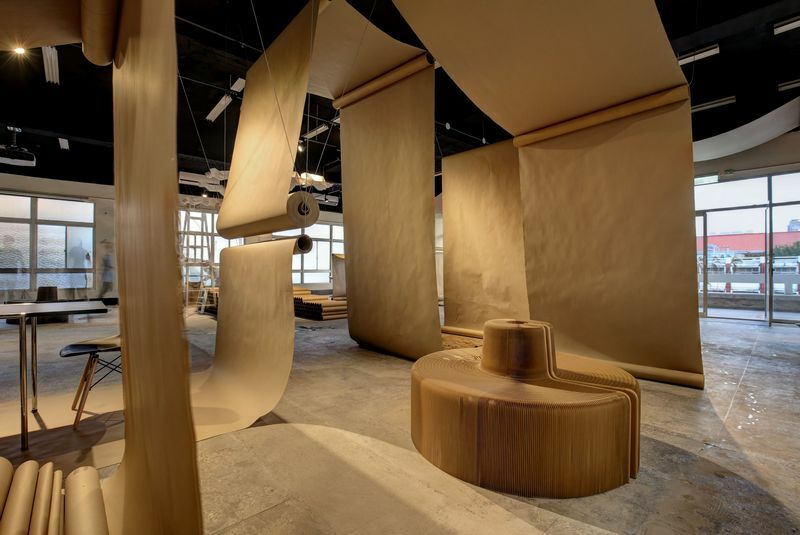 The playful surfaces can be manipulated and transformed as the paper is rolled and unrolled from one end to another, creating an interactive and tactile experience for visitors of all ages to the café. 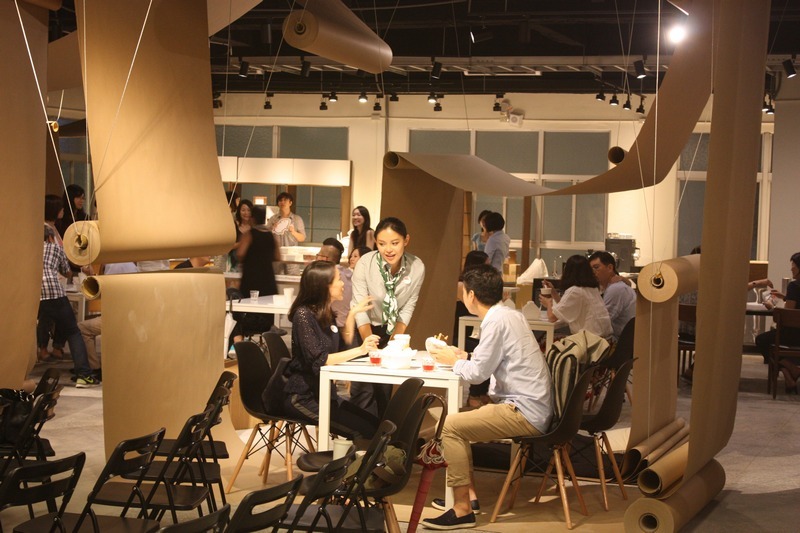 By encouraging customers to interact with and physically alter the space, JCA has inverted the typical café experience, allowing guests to contribute to a deeper practice of community and collective activity. 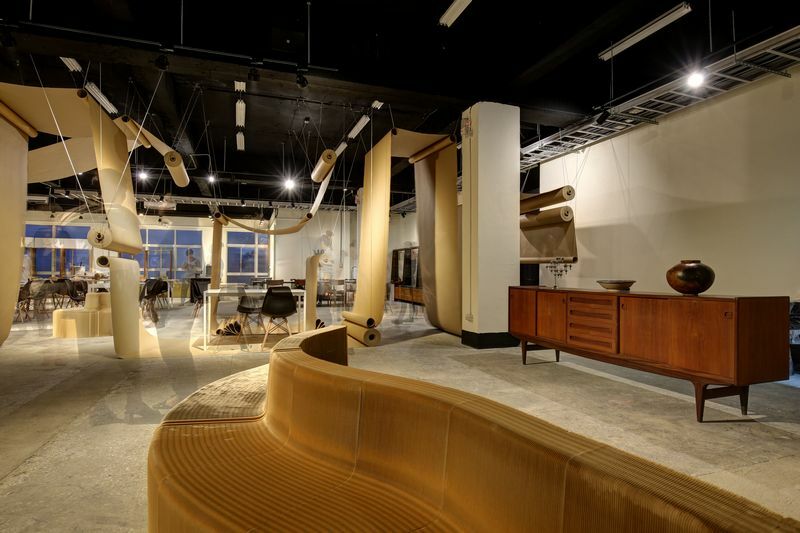 JCA’s unique and collaborative design style has earned them awards from a number of international territories and includes recognition from the China I-ding International Award, Japan Good Design Award, Taiwan Interior Design Award and the 2016 American Architecture Prize for their design of retail giant H&M’s Taiwan head office.